Saudi Arabia dominates the overall GCC air conditioner market. The country is expected to shift its focus towards non-oil sectors in the coming years, which is exhibited to drive the development in the areas of retail, transportation, entertainment & leisure and hospitality. Further, anticipated growth of the residential sector would drive the demand for air conditioners in the country. According to 6Wresearch, Saudi Arabia air conditioner market size is forecast to reach $1.3 billion by 2024. Slumping oil prices and dependence of the country on oil sector majorly impacted country's spending towards infrastructure development during 2014-17. Further, many of the projects during this period were delayed or cancelled, which led to downfall air conditioners market in Saudi Arabia. However, with recovery of oil prices in 2018 and ambitious Saudi Vision 2030 plan to improve the economy would drive air conditioner market especially in residential and commercial sectors. In Saudi Arabia, centralized air conditioner segment has captured majority of the Saudi Arabia air conditioner market share in 2017, where VRF segment is expected to witness highest Saudi Arabia air conditioner market forecast revenues over the coming years. Residential, commercial and retail applications garnered maximum revenue share from air conditioner sales due to rapid growth of large scale projects. Over the coming years, applications such as hospitality and retail sectors are projected to grow at a relatively higher CAGR during 2018-24. The Saudi Arabia air conditioner market report thoroughly covers the air conditioner market by AC types, applications, and regions. 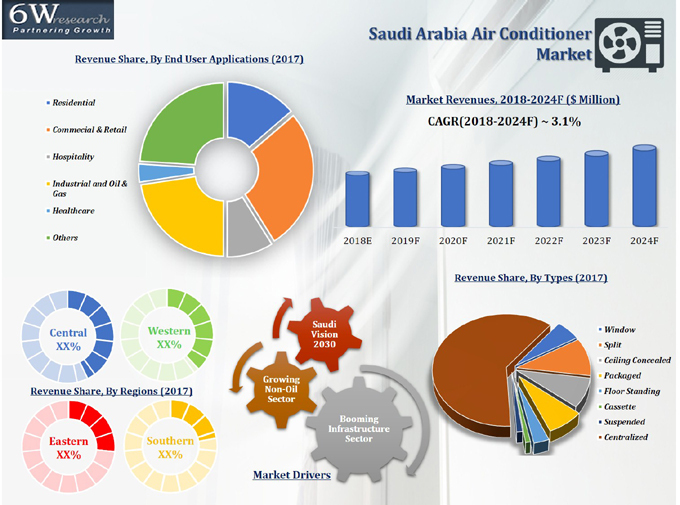 The Saudi Arabia air conditioner market outlook report provides an unbiased and detailed analysis of the Saudi Arabia air conditioner market trends, opportunities/high growth areas and market drivers which would help the stakeholders to decide and align their market strategies according to the current and future market dynamics. 17.9. GREE Electric Appliances Inc.